On the last Bloggers Hangout London Fashion Week Party a few weeks ago, I was introduced to Deborah Mitchell's Heaven collection. I have to be honest this was my fist introduction to this brand which actually has been around for a while and has been praised by many magazines such as the world famous Vogue. Why did I not heard about it before? The mystery is real! But after a long chat with the lovely stand assistant who introduced me to Deborah Mitchell I was getting more and more curious about it especially after hearing that Deborah Mitchell Skincare products are all-natural, organic and Made in UK! You probably know by now that I have a big interest and love on using products that are more eco-friendly and low on carbon footprint. Also its not only it is kind for the environment but to my skin too. After my visit to their stand was very lucky to be given a little goodie bag with not one but two of their products from their Heaven collection. I got given a Heaven Cleansing Cream and the Heaven Dream Oil Serum. 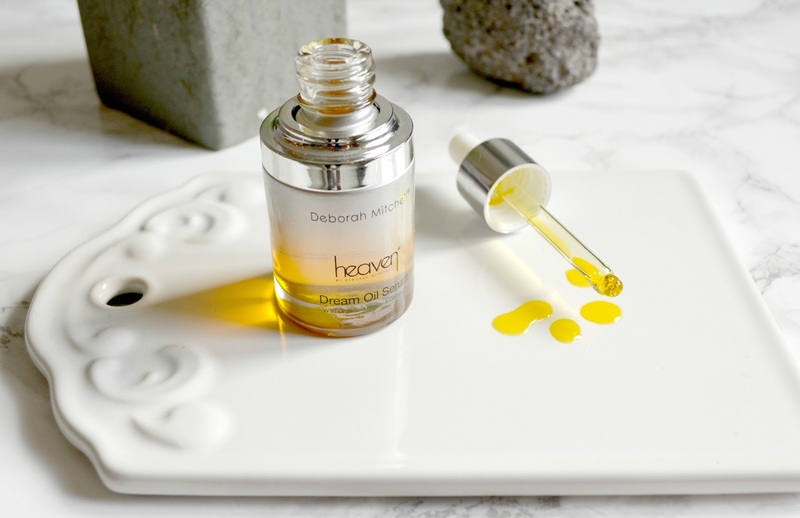 I tried both products over the past few weeks and they are both lovely to use but today I am going to properly introduce you to the Deborah Mitchell Heaven Dream Oil Serum because I just can't get enough of it. You know me and my love for serum (see my review on Maple Holistic Vitamin C Serum or Delia Vitamin A,E & F Serum), as I now use them almost every day as part of my skincare regime and I now couldn't go back to not using them. 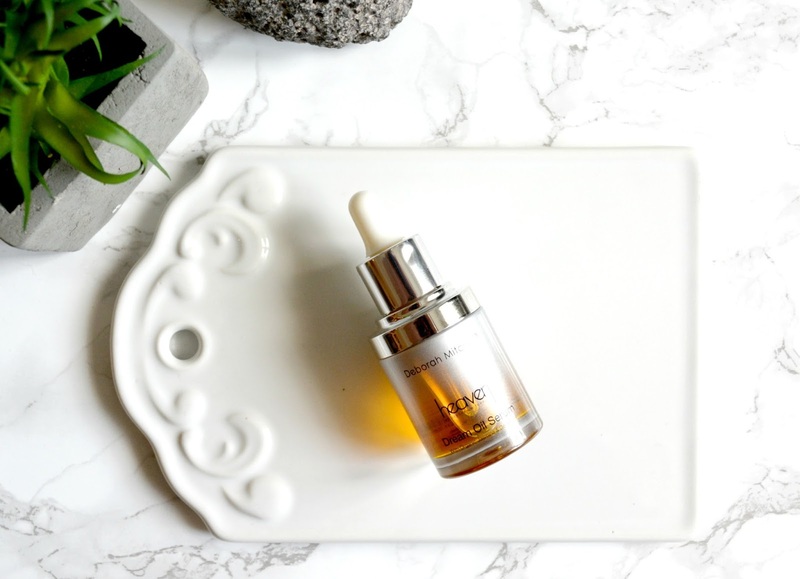 What are the constituents of Dream Oil Serum? As mentioned above this brand uses all-natural organic ingredients and as promised this serum is packed with it and especially with organic Jasmine & Geranium Oil. The properties of both of these oils are well known for being antiseptic, healing, firming, wrinkle reducing and improves cell growth, basically the list goes on and on and I was honestly amazed to read all the benefits of using those oils. Truly these are two beautiful gems of oil. What is the scent? As expected Jasmine and Geranium. I especially love the fact that even though it is a fragrant serum, you can truly sense there are no chemical scents hiding and they are totally natural. I especially love the Jasmine scent that is coming through quite strongly...let's say it always been one of my favourite scents. What about the constituency? Obviously the constituency is oily, as expected, but not at all greasy. I would almost describe it as a silky feel. The colour is beautiful, golden and full of sunshine, truly very pleasing. Oh and don't get putt off by the scent it will disappear after a little while. How do I use it? I have been mostly using this serum as part of my evening skin care routine. I personally use one to two drops into the palm of my hand and I always warm the oil with my hands too and then start massaging my neck and my face until I feel every bit of my face got its fair share. As mentioned above, this serum is not at all greasy and does not leave any residue or stickiness on my skin at all. My skin seems to drink it like a nectar, yet after I can feel my skin becoming super smooth and super relaxed too! I know it sounds odd to say but I do feel relaxed after, perhaps it's the scent or the little facial massage? who knows? Either way I can only adore it and I am certainly not complaining about that. Skin results? My skin feels extra smooth and relaxed in the morning, this product did not give me any breakouts or redness of any kind. Would I purchase it again? Yes, even though it comes at a high retail price of £55 for 30 ml I would, because have been used this serum for almost a month now and the bottle is almost as full as when I first opened. Which mean it will last me for months to come so you get your moneys worth and also because it is a beautiful product inside and out. Would I recommend this product? Yes if you're looking for a silky touch serum, with a beautiful scent, colour, and now you know its all-natural and organic then go for it.